Food waste is a matter of life and death. Wasting food does not directly cause members of our family to die. But, make no mistake, it is a contributing factor. We daily waste enough food to keep entire families alive. And the saddest part of that is we never even give it a thought. Wasting food in a world of hunger is one more sign of our lack of community and our lack of caring for one another. One step toward ending hunger in our lifetime is to be more mindful of our wasteful patterns of consumption. We all need to waste less food. This entry was posted in Facts & Statistics, Hunger & Poverty, News & Views and tagged America, caring, community, consumption, dairy, family, food waste, fruits, grain, hunger, meat, morality, poverty, seafood, USDA, values, vegetables on November 10, 2015 by Ray Buchanan. The older I get the more I realize that happiness doesn’t come from things. The joy we all seek comes from relationships and an inner recognition of how truly blessed we are. More stuff is not the answer. Contentment comes from our awareness that the more stuff we own the less freedom we actually have. 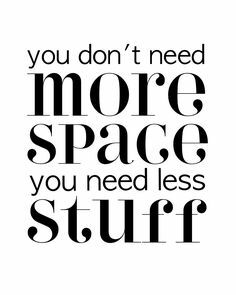 We truly do not need more stuff. We need more silence, more solitude and a deeper appreciation for all that we already have. But, that would be un-American, wouldn’t it? This entry was posted in Hunger & Poverty, News & Views and tagged acquisition, appreciation, consumption, contentment, freedom, greed, quietness, responsible lifestyle, silence, simplicity, solitude on June 6, 2015 by Ray Buchanan. O gracious and and merciful Father, You have graced us with another beautiful day. Thank you for such a precious gift. Help us truly live alive during this day. Help us see the awesome work of creation with fresh eyes. Help us walk with both wonder and reverence on this planet you created so perfectly. And help us come to the realization that we have both the power and the responsibility to care for all the beauty with which we are surrounded. Convict us of our wanton misuse of all that we have been given, and empower us afresh to become true caretakers of our world. Let our love for you overwhelm our greed and need to consume. And let our faithfulness shine forth in the actions we take to demonstrate our reverence for all you have provided to sustain us. This entry was posted in Prayers, Spirituality & Religious Writings and tagged care takers, consumption, creation, faithfulness, gifts, greed, mercy, misuse, planet, prayer, responsibility, reverence, stewardship, wonder, world on February 22, 2015 by Ray Buchanan.